You are driving down the road and enjoying an afternoon in Reno when a pebble hits your windshield. By the time you arrive home and assess the damage, it is clear that you have a chipped or cracked windshield. Here are some tips from a Reno auto body shop on what to do when you have a chipped or cracked windshield. A cracked windshield in Reno can be very dangerous. Take your car to an auto body repair shop to get a windshield repair. Even if the damage does not obstruct your view, you will want to fix the cracked windshield as soon as possible. A car with a cracked windshield in Reno’s climate left untreated can lead to more problems or even cause an auto accident. Cracked windshields are a common problem in Reno and Sparks. Window glass can expand and contract in hot or cold temperatures. The temperature changes can make a small chip in your windshield grow and cause further damage or impair your ability to see while driving. A qualified team at an auto body shop in Reno can help you learn if you need a repair or full windshield replacement. If the crack in the windshield is rather deep, the damage may have permeated the top layer. Once a chip or crack goes deeper than the lamination, there can much bigger problems. In this case, you will need to replace your cracked windshield at a Reno auto body shop. Many windshield chips or cracks smaller than the size of your hand can be repaired instead of replaced. If the chip or crack in the windshield is more superficial, you may be able to repair your windshield with a DIY windshield repair kit. If you choose to repair a cracked windshield on your own, you may want to consider that a DIY project can take many hours. At Liberty Collision in Reno, we can provide cracked windshield replacement. At Liberty Collision in Reno, our team can perform a safe and efficient windshield repair or replacement. Liberty Collision owner Donnie Thiessens has been a resident of the Reno community for over 50 years, so he knows how a cracked windshield can get much worse in Reno’s climate. 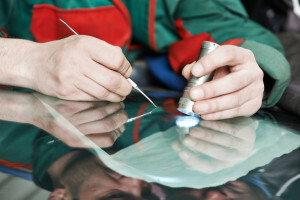 Auto body shop mechanics at Liberty Collision can determine if your cracked windshield needs a repair or a replacement. Our estimator can provide the cracked windshield repair or replacement cost. 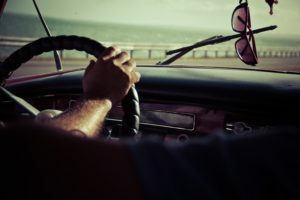 With over 25 years of car repair experience, our team of auto experts can get you back on the road in great condition. Don’t wait for your chipped or cracked windshield to cause you more trouble like an auto accident. Contact us for an estimate on your cracked windshield in Reno or Sparks today!